Trade union action has been a feature of the British labour market over the past few years, as discussed in this first and second blog. With the government’s austerity measures still in place and ongoing issues over pension provision, there are many explosive issues that will undoubtedly be discussed at this year’s TUC Conference in Brighton. Although few would argue against the notion that the government’s finances are in a dire state and spending cuts together with tax rises are needed, the controversy seems to lie in exactly when these cuts should take place and how severe they should be. For many, cutting government spending and raising taxes whilst the economy is still in recession is asking for trouble. For others, it’s the right thing to do and everyone should play a part in helping to return government finances to a semblance of balance. The Labour government has traditionally supported trade unions, but even their leadership backed the government’s plan for pay restraint for public sector workers. This, together with the continuing debates over public sector pensions has clearly angered many public sector workers, thus creating this ‘inevitable’ industrial action over the coming year. Unison and GMB have said that they will be working together in order to try to better pay and conditions for its members, by co-ordinating public-sector strikes around Spring next year. Co-ordinated strikes across a variety of sectors could create havoc for the economy. Not just disruption for the everyday person, but losses for businesses and the economy. A general strike has not taken place since 1926, but it is thought that TUC delegates will be voting on whether or not one should be planned. So, when faced with these inevitable strikes, should the government back down and cut back on austerity or stand up to them and suffer the disruption of a strike, whilst continuing on with bringing its budget back on track? The following articles look at the TUC Congress and the proposed strike action. What is the difference between individual and collective bargaining? Why is collective bargaining likely to be more successful in achieving certain aims? If there is co-ordinated strike action, what are the likely costs for (a) the workers on strike (b) the non-striking workers (c) businesses and (d) the economy? What are the main issues being debated between unions and the government? Explain the economic reasoning behind Dave Prentis’ statement that people are being moved into poverty. 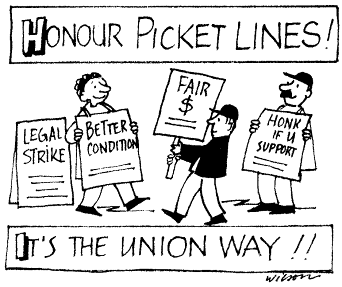 Do you agree with strike action? Do you think it has any effect? When do you think is the right time to implement austerity measures? Has the government got it right? As always, make sure you explain your answer!! There’s been a lot of bad news about the economy, but perhaps things are looking up. Inflation is now at 4% and the latest data suggests that unemployment has fallen, with more jobs being created in the private sector. An estimated 143,000 jobs were created, many of which were full-time and the ILO measure if unemployment is down by some 17,000. There is still some doom and gloom, as growth in annual average earnings has fallen slightly and this will undoubtedly affect retail sales. Numbers claiming JSA have also increased marginally to 1.5 million and youth unemployment has seen a small increase to 20.4%. A big area of concern is that unemployment might rise in the coming months due to the time lag. Growth in the last quarter of 2010 was negative and this could increase unemployment when the full effects are felt in the labour market later in the year. Howard Archer, the Chief Economist at HIS Global Insight had this to say about the latest data. The wage price spiral hasn’t begun as many though, and this may encourage the Bank of England to keep interest rates down, especially as inflation has come down to 4% and concerns about growth still remain. So despite good news about unemployment overall falling, young workers, women and public sector workers have not benefited. Youth unemployment is up, more women are claiming JSA and more jobs in the public sector are expected to be cut this year. The following articles consider the implications. What is the ILO method of measuring unemployment? To what extent does the change in unemployment and inflation conform with the Phillips curve? What can explain the fall in the unemployment rate, despite the decline in the economy in the last quarter of 2010? Explain how the FTSE was affected by the lower unemployment rate. Why is unemployment expected to rise later this year? Why has there been a rise in the numbers claiming JSA, despite unemployment falling? What is meant by the wage-price spiral and why has it not occured?